It’s a festival! A festival! Time for a festival of cards! For cards with “Choose 1 Rearguard, it gains 4000 Power, when that turn ends, draw 1 card, and retire that Unit.” abilities, if the choosen Rear-guard disappears, will you draw a card? or not draw a card? CONT (RC) Brave:If you have an “Altmile” Vanguard, this Unit can intercept from the Back Row. AUTO GB1 Brave: When this Unit is placed on (RC), if you have an “Altmile” Vanguard, during that turn, this Unit gains Power+5000, and when that turn ends, choose 1 of your other (RC) with no Units, move this Unit there. AUTO (RC) GB1: [Choose 1 of your other Rearguards, Retire it] When this Unit’s Attack Hits, you can pay the cost. If you pay it, draw 1 card. CONT (RC) GB1 Unite: For each of your Units with the Unite ability, this Unit gains Power+1000. CONT RC: If this card is Engorged, this Unit gains Power+2000. AUTO: [SB1] When this Unit is retired from (RC) by the cost or effect of your “Gaia” Unit, you can pay the cost. If you pay it, draw 1 card. Shadowstitch – AUTO (RC): [Choose 1 of your Normal Units from your Drop Zone, place it on the bottom of your Deck] At the end of a battle in which your Unit attacked a Vanguard, if its attack didn’t hit, you can pay the cost. If you pay it, during that turn, this Unit gains Power+3000. Rush – AUTO (RC) GB2: When this Unit [Stands] due to your card’s effect, if you have a “Victor” Vanguard, during that turn, this Unit gains Power+5000. AUTO (RC) GB1: When you Drive Check a Grade 3 card, choose 1 of your opponent’s front row Rearguards whose Power is less than this card’s Power, Retire it. Bloom – AUTO (RC); [SB1 & Rest this Unit] When your Unit with the same name as this Unit is placed on (RC), you can pay the cost. If you pay it, Counter Charge 1, then choose up to 2 of your Units, during that turn, they gain Power+4000. 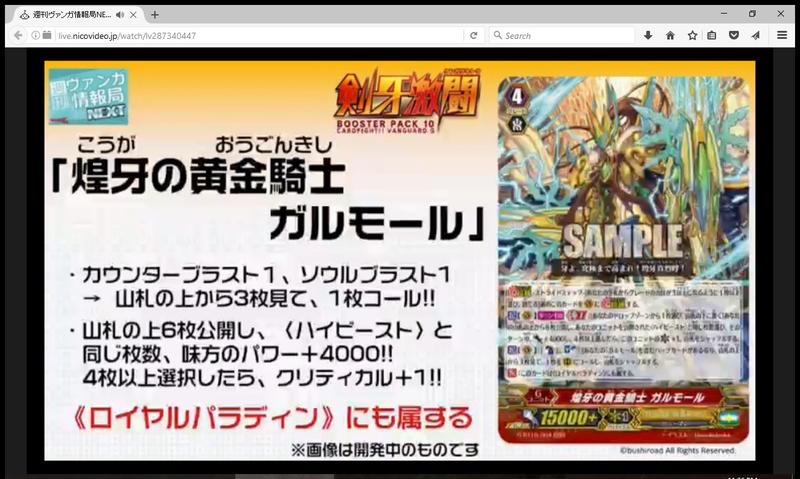 CONT [Front Row (RC)] GB1: If you have a “Ranunculus” Vanguard, this Unit gains Power+2000. Rush – AUTO (VC/RC) GB2: When this card Stands due to your card’s effect, during that turn, all of your front row Rearguards gain Power+2000. AUTO (VC): During your turn, when your G Unit [Stride]s, choose 1 of your Vanguards, during that turn, it gains “AUTO (VC) 1/Turn: [SB1] When this Unit attacks a Vanguard, you can pay the cost. If you pay it, choose 1 of your Rearguards with the Rush ability, that Unit and all of your Rearguards in the same column as it all Stand.”. ACT (VC) 1/Turn GB2: [Choose 1 of the cards in your Drop Zone, place it on the bottom of the Deck] Reveal the top 6 cards of your Deck, choose an equal number of your Units as the number of revealed <High Beast> among them, until the end of the turn, they gain Power+4000 and if you choose four or more Units, this Unit gains Critical+1. Shuffle your Deck. ACT (VC): [Counter Blast 1 & Soul Blast 1] If you have a “Garmore” Heart Card, look at the top 3 cards of your Deck, call a card to (RC) from them, and shuffle your Decl. [CONT]: This card is also a <<Royal Paladin>>. For 3 Treasure Points, you can now get a Blaukluger themed Sleeve and Deck Holder Set.